Visitors must see the perfect model replicas of the Santa Fe depot, the Harvey House and the Temple Ice Plant. 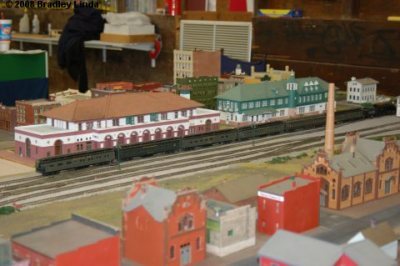 The layout to date includes award winning scratch built replicas of the Santa Fe Depot, Harvey House, and first Ice House. Dan Ladd has constructed the Depot and Harvey House. James Bush built the Ice House. Other members have contributed to the construction of the roundhouse, turntable, oil storage tanks, and city buildings. Work on scenery and structures is ongoing.